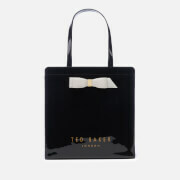 'Helena' cross body bag from Ted Baker. Crafted from pebble-textured bovine leather with a softly structured silhouette and a sumptuous suede flap with a push-lock closure and a brushed gold padlock embellishment. The shoulder bag opens showcases a dual-compartment design with a bow print lining and internal slip and zip pockets. Features a gold-toned chain strap that can be detached to form a clutch. 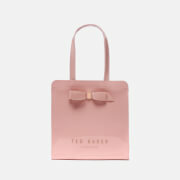 Complete with signature foil branding and a Ted Baker dust bag. Dimensions: H: 17cm x W: 24.5cm x D: 9cm. Strap Drop: 55cm.